Definition at line 40 of file CCallParameters.h. Definition at line 50 of file CCallParameters.h. Definition at line 54 of file CCallParameters.h. Definition at line 58 of file CCallParameters.h. Definition at line 62 of file CCallParameters.h. Definition at line 94 of file CCallParameters.h. Referenced by CMassAction::calcValue(), CFunction::calcValue(), CMathExpression::CMathExpression(), CMathExpression::createMassActionPart(), CMassAction::dependsOn(), and CFunction::dependsOn(). Definition at line 82 of file CCallParameters.h. 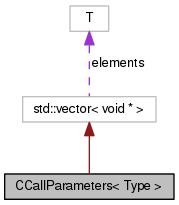 Referenced by CFunctionParameterMap::clearCallParameter(), and CFunctionParameterMap::clearCallParameters(). Definition at line 97 of file CCallParameters.h. Referenced by CMassAction::calcValue(), CMathExpression::CMathExpression(), CMathExpression::createMassActionPart(), CMassAction::dependsOn(), CFunction::dependsOn(), and CCallParameters< CCopasiObject >::resize(). Definition at line 88 of file CCallParameters.h. Definition at line 91 of file CCallParameters.h. Definition at line 76 of file CCallParameters.h. Definition at line 79 of file CCallParameters.h. 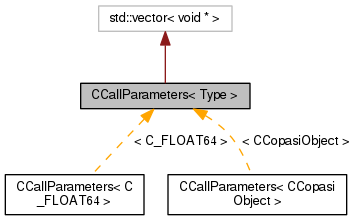 Definition at line 64 of file CCallParameters.h. Definition at line 85 of file CCallParameters.h. Referenced by CFunctionParameterMap::checkCallParameters(), CFunctionParameterMap::getObjects(), and main().